LAFAYETTE, LA - Are you looking for something fun and unique to do for Halloween? Well, you won't want to miss this one. I mean really, what is better than a Ghost Hunter's Bash. I'm sure it will be an experience you will never forget. 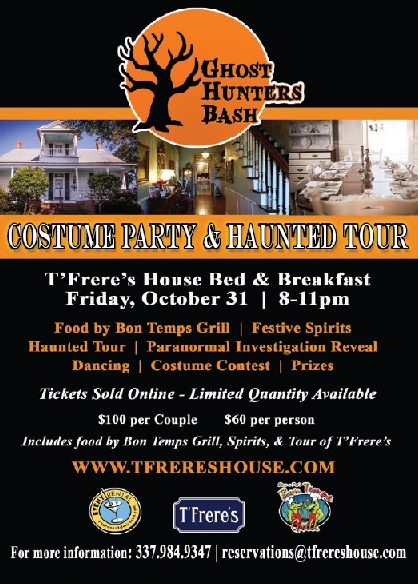 On Friday, October 31, 2014 T’Frere’s House Bed & Breakfast is thrilled to host their very first Halloween event. New T’Frere’s owner, Richard Young of Event Rental, invites guests to enjoy the hauntingly glamorous festivities of T’Frere’s Ghost Hunter’s Bash! The fright-astic holiday event is intended for adults only and will be celebrated with a fun-filled evening of dancing, a “to die for” costume contest with Special Guest Judge Sharon Moss, and an interactive tour of T’Frere’s House! Following the haunted tour Louisiana Spirits will reveal the results of their recent paranormal investigation, and guests will have the opportunity to learn more about the history and legends surrounding the home. Tickets for the event include delicious food by Bon Temps Grill, festive spirits by Feed & Seed, and of course an unforgettable Halloween party! Tickets are $100 per couple or $60 per person. Rooms are still available for party-goers to stay overnight at a discounted rate of $100 in addition to tickets for event and includes breakfast for 2 guests. For more information or to purchase tickets, please email reservations@tfrereshouse.com or call 337.984.9347. Ghost Hunter’s Bash tickets and rooms are limited so reserve yours now! Check out the T'Frere's House website and Facebook page to keep up to date with everything.